Mutations in BRCA1, BRCA2, ATM, TP53, CHK2 and PTEN account for many, but not all, multiple-case breast and ovarian cancer families. The histone acetyltransferase gene EP300 may function as a tumour suppressor gene because it is sometimes somatically mutated in breast, colorectal, gastric and pancreatic cancers, and is located on a region of chromosome 22 that frequently undergoes loss of heterozygosity in many cancer types. We hypothesized that germline mutations in EP300 may account for some breast cancer families that include cases of gastric, pancreatic and/or colorectal cancer. We screened the entire coding region of EP300 for mutations in the youngest affected members of 23 non-BRCA1/BRCA2 breast cancer families with at least one confirmed case of gastric, pancreatic and/or colorectal cancer. These families were ascertained in Australia through the Kathleen Cuningham Foundation Consortium for Research into Familial Breast Cancer. Denaturing HPLC analysis identified a heterozygous alteration at codon 211, specifically a GGC to AGC (glycine to serine) alteration, in two individuals. This conservative amino acid change was not within any known functional domains of EP300. The frequency of the Ser211 variant did not differ significanlty between a series of 352 breast cancer patients (4.0%) and 254 control individuals (2.8%; P = 0.5). The present study does not support a major role for EP300 mutations in breast and ovarian cancer families with a history of gastric, pancreatic and/or colorectal cancer. Pathogenic mutations in BRCA1 and BRCA2 account for the majority of but not all multiple-case breast cancer families that include members with ovarian cancer or male breast cancer. Among families with four or more female cases of breast cancer, almost 70% may be due to other predisposition genes . Because there is a plethora of plausible breast cancer susceptibility candidates, any approach to their identification must be focused. Tumour suppressor genes that are known to be somatically inactivated in breast cancers are particularly attractive candidates and warrant close scrutiny. One such gene is EP300, which is a member of the histone acetyltransferase group of proteins. Its encoded protein, EP300, has been shown to regulate transcription through chromatin remodelling and by acting as a transcriptional coactivator . It has been speculated that EP300 may play a central role in regulating responses to signals that induce growth or differentiation . Several lines of evidence suggest that EP300 may function as a tumour suppressor. EP300 is a target for adenoviral E1A oncoprotein, the binding of which has been reported to be associated with malignant transformation. The gene is located on chromosome 22q, which is a region that exhibits frequent loss of heterozygosity in a variety of cancer types, including breast, ovarian, colorectal, gastric and pancreatic cancers [4–11]. Muraoka and coworkers  reported somatic mis-sense alterations in EP300 in one of 27 colorectal cancers and in one of two gastric cancers. Subsequently, Gayther and coworkers  identified six truncating mutations in a study of 193 ovarian, breast, colorectal, pancreatic, lung and brain tumours. Two of these mutations were detected in primary breast and colorectal cancers, and four were detected in breast, colorectal and pancreatic cancer cell lines. More recently, we identified inactivating mutations in EP300 in approximately 25% of colorectal cancer cell lines . In addition to epithelial malignancies, EP300 has been implicated in the development of acute myeloid leukaemia, in which where translocations involving fusion of EP300 with the monocytic leukaemia zinc finger protein have occasionally been observed [15–17]. These data, coupled with the known involvement of EP300 in a wide range of cellular processes that are associated with malignancy, strongly suggest that it may be a tumour suppressor. It is not known whether germline alterations in EP300 are involved in any cancer predisposition syndrome and, with so few somatic alterations reported, it would be difficult to predict the clinical features of such a syndrome. Nevertheless, we postulated that, in addition to breast cancer, germline mutations in EP300 may predispose to colorectal cancer because somatic mutations have previously been described in primary colorectal cancers [12, 13] and truncating mutations were identified in four of 17 cancer cell lines . In addition, pancreatic and gastric cancers may also be a feature of such families because mutations have been described in pancreatic cell lines  and somatic missense alterations have been observed in one out of two primary gastric tumours studied . EP300 is a large gene spanning approximately 90 kilobases on chromosome 22q13.2; it encodes a 2414 amino acid protein with a molecular weight of approximately 260 kDa. The 8.6 kilobase mRNA transcript is encoded in 31 exons, with 5' and 3' noncoding regions of 778 base pairs and 1117 base pairs, respectively. Analysis of cancer cell lines suggests that inactivation of EP300 occurs predominantly as a result of protein truncating mutations (frame shift and single nucleotide insertions/deletions) . In order to investigate the role played by germline mutations in EP300 in breast cancer predisposition, we undertook a mutation analysis of all 31 coding exons of EP300 among 23 multiple-case breast cancer families, which included cases of pancreatic, gastric and/or colorectal cancer. Multiple-case breast cancer families with at least one case of pancreatic, gastric and/or colorectal cancer were ascertained through the Kathleen Cuningham Foundation Consortium for Research into Familial Breast Cancer (kConFab; http://www.kconfab.org/). Confirmation of cancer diagnosis was obtained from pathology reports or medical records, and was available for 61% of breast cancer cases and for at least one case of pancreatic, gastric and/or colorectal cancer. Twenty-three multiple-case families were identified, which included at least one case of pancreatic cancer (three families), gastric cancer (nine families) and/or colorectal cancer (17 families; Table 1). 1The number of tumors includes proband's tumors. bil, bilateral breast cancer; br, breast cancer; ov, ovarian cancer; stom, stomach cancer; th, thyroid cancer. The kConFab entrance criteria for families without a known mutation in BRCA1 or BRCA2 are four or more cases of breast or ovarian cancer in the same or adjacent generations (or two or more if one has 'high risk' features, such as breast cancer diagnosis at age under 40 years, male breast cancer, bilateral breast cancer, or ovarian and breast cancer in the same woman). All of the families were tested by diagnostic laboratories for mutations in BRCA1 and BRCA2 by a variety of means, including single-stranded conformational polymorphism/heteroduplex analysis, protein truncation tests, chemical mismatch cleavage and/or allele specific oligonucleotide hybridization. The overall sensitivity of these tests for detecting mutations in BRCA1 and BRCA2 is estimated at 80%. In addition, nine out of 23 index cases were found to be mutation negative after full sequencing of BRCA1 and/or BRCA2. The index case, defined as the youngest available breast cancer patient, was identified from each of these families for mutation analysis (Table 1). In some families, such as those of proband 0017 and 1018, there was no younger case with breast, colorectal, gastric or pancreatic cancer available for testing. The frequency of any germline variants was assessed in a series of breast cancer cases and control individuals. The 352 breast cancer patients were recruited in a hospital-based case–control study of breast cancer predisposing genes, carried out at breast clinics in the Wessex region of southern England. They were selected on the basis of age at onset under 40 years (203 cases), a family history of breast cancer (defined as two or more cases of breast cancer in a first-degree or second-degree female relative) irrespective of age at onset (105 cases), or bilateral breast cancer diagnosed after 39 years of age irrespective of family history (44 cases). All breast cancer patients were systematically identified through breast clinics in the Wessex region of southern England, as described previously [18, 19]. The age range of the breast cancer patients was 19–79 years, with a mean age of 38 years. The control individuals were representative of the population from which the patients arose, and included 254 Caucasian female volunteers who either were staff at the Princess Anne Hospital, Southampton, UK or were patients attending for non-neoplastic disease conditions. The age range of the control individuals was 18–84 years, with a mean age of 39 years. For all groups normal genomic DNA was prepared from blood lymphocytes. Comparisons of genotype frequencies were analyzed using Fisher's exact test using the relevant 2 × 2 contingency tables. All statistical calculations were two-sided and performed using InStat version 3.01 (GraphPad Software Inc., San Diego, CA, USA). P < 0.05 was considered statistically significant. Normal genomic DNA was prepared from blood lymphocytes for all index cases and control individuals. All 31 coding exons of EP300, including splice junctions, were amplified from genomic DNA using primers binding to complementary intronic regions (Table 2). Because of their larger size, exons 2, 14 and 31 were amplified in overlapping segments using primers complementary to exonic sequences. 1All primer sequences are shown in the 5' to 3' direction. 2The optimal melting temperature for each PCR fragment were calculated using the DHPLC Melt program http://insertion.stanford.edu/melt.html. Where more than one optimal temperature was predicted, both were used in the DHPLC analysis. 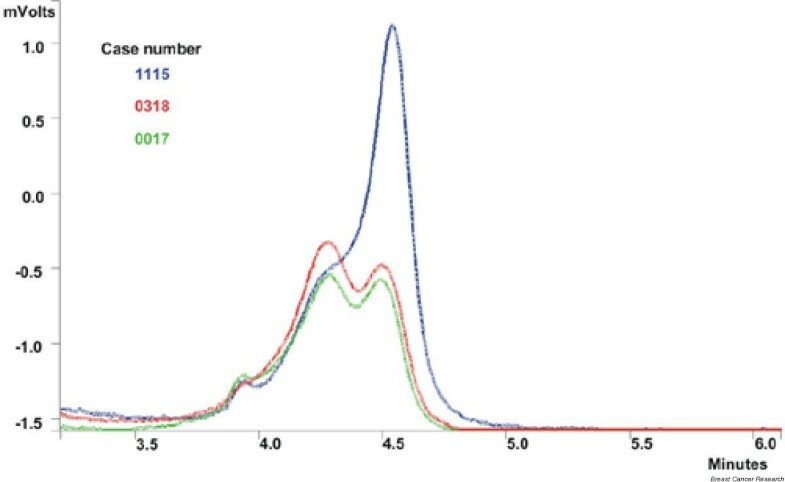 PCR was performed in a reaction volume of 20 μl containing 50 ng genomic DNA, 25 ng of each primer, 10× reaction buffer, 1 μl of a nucleotide mix (4 mmol/l each of dCTP, dTTP, dGTP and dATP) and 0.5 μ Taq DNA polymerase (AmplitaqGold; Perkin-Elmer, Branchbury, NJ, USA). The standard program used for PCR amplification was as follows: one initial denaturation step of 94°C for 5 min, 35 cycles of 30 s denaturation at 94°C, 30 s of annealing (50–60°C), and 60 s extension at 72°C, followed by a final elongation cycle at 72°C for 5 min. All PCR products were checked for purity on 2% agarose gels. Before denaturing HPLC (DHPLC) analysis, the PCR products were denatured at 95°C for 5 min and gradually cooled to 65°C at a rate of 1°C/min. The optimal melting temperatures for each PCR fragment are shown in Table 2 and were calculated using the DHPLC Melt program http://insertion.stanford.edu/melt.html. Samples of 4 μl were then analyzed on a Varian-Helix DHPLC system (Varian, Inc., Palo Alto, CA, USA) using a Helix DNA 75 mm × 3.0 mm column. Analysis was carried out at the recommended melt temperature using the universal elution conditions recommended by the manufacturer. Briefly, DNA was eluted at a flow rate of 0.45 ml/min with a total running time of 8 min and 50 s in a linear acetonitrile gradient made by mixing buffer A (0.1 mmol/l triethylammonium acetate, 0.1 mmol/l EDTA) with buffer B (0.1 mol/l triethylammonium acetate, 25% acetonitrile, 0.1 nmol/l EDTA). Initially, the samples were eluted for 30 s with a constant buffer B content of 45%. This was followed by a 5 min 30 s period during which the buffer B concentration increased from 45% to 68%. The buffer B concentration was then held at 68% for 1 min and thereafter decreased to 45% for a further 1 min and 50 s. Samples with variations in elution profiles were identified using the Varian Star Reviewer software package. For each variant elution profile, the genomic DNA was re-amplified with the DHPLC primers and sequenced using the Big-Dye sequencing chemistry (Perkin-Elmer). DHPLC analysis of the youngest available member affected with breast cancer from each of the families identified only two with variations in elution profiles, both of which were in exon 2b of EP300 (Fig. 1). Individual 0017 had breast cancer (age at onset 70 years) and a family history of female breast cancer (three cases) and gastric cancer (one case; age at onset 45 years). Individual 0318 had breast and ovarian cancer (age at onset 41 and 46 years, respectively) and a family history of biliary tract cancer (age at onset 80 years), breast cancer (seven cases), ovarian cancer (two cases), bowel cancer (age at onset 73 years) and gastric cancer (age at onset 70 years; Table 1). Sequencing revealed that both individuals harboured a heterozygous G1830A substitution (NM_001429; gi:4557556) in codon 211, resulting in a glycine to serine substitution. Denaturing HPLC (DHPLC) elution profile of EP300 exon 2b run at 60°C. Individuals 0318 (red trace) and 0017 (green trace) exhibit two distinct peaks compared with control individual 1115 (blue track) with only one major peak. To further investigate the possible role of this variant in cancer predisposition, we conducted a case–control study using a UK-based series of 352 breast cancer patients and 254 control individuals. The frequency of heterozygous carriers of the Ser211 variant was determined by DHPLC analysis. We did not find any significant difference in the frequency of carriers of the Ser211 variant between the patients (14/352 [4.0%]) and control individuals (7/254 [2.8%]; P = 0.5). The EP300 gene is located at the centre of a region of frequent loss of heterozygosity in breast and ovarian cancer, and has recently been implicated as a tumour suppressor gene by the identification of somatic alterations in breast, colon, pancreatic and gastric primary tumours and cell lines. As such, we reasoned that EP300 was a plausible susceptibility gene in multiple-case breast and ovarian cancer families with additional cases of gastric, pancreatic and/or colorectal cancer. However, in the present study we identified only one coding variant of EP300 in two out of 23 such multiple-case cancer families. This glycine to serine substitution is unlikely to have any detrimental impact on the activity of EP300 because both are small, neutral and uncharged amino acids, and the substitution is located in a region of the EP300 protein with no recognized functional domain. The polymorphism has no effect on exonic splicing enhancers as predicted by the ESEfinder program http://exon.cshl.org/cgi-bin/ESE. Furthermore, the fact that no significant difference was detected in the frequency of this variant among 254 control individuals and 352 breast cancer cases further suggests that it represents a nonpathogenic polymorphism. Given that DHPLC is a robust and sensitive screening technique, we consider it unlikely that we missed any pathogenic variants among the 23 index cases analyzed. In particular, we analyzed each PCR fragment at all the temperatures recommended by the DHPLC Melt algorithm, and under these conditions DHPLC has been reported to have a sensitivity of 99.4% . In the present study we restricted our analysis to non-BRCA1/BRCA2 mutation families with a family history that included gastric, pancreatic and/or colorectal cancer because somatic mutations have been identified in EP300 in these cancer types. However, it is possible that this may not be a reliable indicator of a familial cancer phenotype generated by germline mutations in EP300, given that our selection criteria were based on identification of mutations in only a small number of cancers [12, 13]. Furthermore, we tested only 23 probands and can only conclude that germline EP300 mutations are not common in this sample set. Based on the spectrum of mutations observed in sporadic tumors, we hypothesized that germline mutations in EP300 may account for some breast cancer families that contain cases of gastric, pancreatic and/or colorectal cancer. Analysis of 23 probands suggests that germline EP300 mutations do not play a major role in breast cancer families with a history of these other cancer types. However, the study does not entirely exclude the possibility that EP300 may represent a breast cancer susceptibility gene, and more extensive studies of non-BRCA1/BRCA2 breast cancer families, irrespective of a history of other cancer types, are warranted. The authors should like to thank Heather Thorne, Lynda Williams and Danni Surace for DNA preparation, the kConFab research nurses and staff of the Familial Cancer Clinics for data collection, the kConFab Central Registry staff for supplying data, and the families for their participation. kConFab is supported by the National Health and Medical Research Council of Australia, the National Breast Cancer Foundation of Australia, and the Cancer Councils of Victoria, Western Australia, Queensland, New South Wales and South Australia. IGC is supported by the Victorian Breast Cancer Research Consortium.